The purpose of this study was to compare clinical outcomes and structural integrity following arthroscopic rotator cuff repair, either with intra-articular injection of corticosteroids in the early postoperative period using ultrasound guidance or without it. 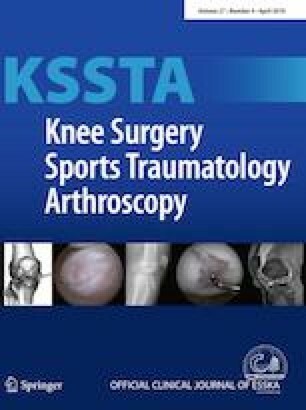 This study included 318 patients who underwent arthroscopic repair for either a partial-thickness or small-to-medium-sized full-thickness rotator cuff tear from 2012 to 2015. Patients were divided into two groups based on the administration of an intra-articular corticosteroids injection at 3 months after the surgery: group A (with corticosteroid injection, n = 56) and group B (without corticosteroid injection, n = 262). Functional outcomes were evaluated using the visual analog scale (VAS) pain score, subjective shoulder value (SSV), American Shoulder and Elbow Surgeons (ASES) score, University of California Los Angeles (UCLA) shoulder score, and active range of motion (ROM). Postoperative magnetic resonance arthrography (MRA) was performed 6 months postoperatively to assess structural integrity. At the 2-year follow-up, both groups showed no significant differences in VAS pain score (group A/B, 1.1 ± 0.9/1.1 ± 1.1), functional scores including SSV (88.5 ± 10.8/88.3 ± 10.0), ASES (90.8 ± 6.6/90.4 ± 6.9), and UCLA scores (30.2 ± 5.6/30.7 ± 5.2), and active ROM including forward flexion (151° ± 8°/153° ± 7°), external rotation (54° ± 5°/55° ± 7°), and internal rotation (10 ± 1/10 ± 2). Follow-up MRA imaging collected 6 months after surgery showed no significant difference in the re-tear rate (n.s.) between group A and B (n = 10/56, 17.9% and 45/262, 17.2%, respectively). Intra-articular corticosteroids injection in the early postoperative period after arthroscopic rotator cuff repair provided satisfactory pain relief and ROM improvement without increasing the re-tear rate or deteriorating clinical outcomes at the 2-year follow-up. The authors received no financial support related with the current study. The authors declare that they have no conflict of interest.. This study was approved by the Institutional Review Board for Severance Hospital at the Yonsei University College of Medicine (IRB no. 4-2018-0055).